Gaokgatlhe Mirriam Tawane has a Bachelor of Science degree (2006), Honours degree (2007) and Master of Science degree in Palaeontology (2010, converted to PhD), and a PhD degree in Palaeoathropology (2012), all awarded by the University of the Witwatersrand. 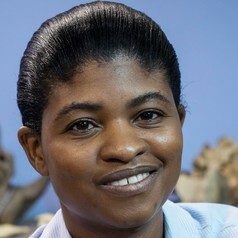 She is the first black South African female to qualify as a Palaeoanthropologist. She served as a council member for the National Heritage Council as a Ministerial appointment from 2015 up to 2017. She is currently the curator of Plio-Pleistocene palaeotology at the Ditsong National Museum of Natural History, where the well-known Mrs/Mrs Ples (Australopithecus africanus) is curated. She has been involved in Palaeosciences outreach for the past ten years. She is passionate about the country’s heritage, and has participated in several community projects to teach learners and the general community about their heritage with respect to Palaeosciences. Majority of these projects are carried out in the language choice of the audience. She has marketed, organised and conducted the Heritage Day celebrations at Taung for three consecutive years. Matric learners from 19 rural schools in the area participated in the event. She recently conducted a human evolution workshop in Taung, with the aim of taking Palaeosciences to the rural areas of Taung. Taung is known for the famous finds of Australopithecus africanus in 1924 in the area. The project addressed the gap that exists between the scientific community and the local communities of Taung, as well as the lack of knowledge and exposure of Palaeosciences to the locals.